Welcome to Kingdom Hearts: World Destiny! We are an AU Kingdom Hearts RP with no word count. World Destiny's story takes place post Dream Drop Distance, at which point we make considerable steps in our own story direction. Feel free to check out the Plot link to find out more! All guests are welcome to drop in and say hi! Two years after the events of Dream Drop Distance, the Darkness became so great that it swallowed the worlds, locking them away within its merciless abyss. Twilight Town, now covered in eternal night, stands as one of last Sanctuaries of Light. It is where players begin their journey. Ever resourceful, the Moogles have created a safe place for refugees. They have charged the Denizens of Light with finding Castle Oblivion: it holds a key to the puzzle of the lost worlds. But within the dark shadows of the sanctuary world a powerful dark force still looms, waiting to strike. Each survivor must choose whether to go to Castle Oblivion or stay behind to protect the world from the dragon that lurks in the shadows. The entire site got a face-lift! If you have any suggestions, feedback is encouraged in the Site Improvement section! Castle Oblivion The attempt to activate Castle Oblivion's Mognet teleport started! That's one step closer to reclaiming the lost worlds! 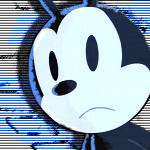 "Oswald is my personal favorite character, so I'm using him for this Roleplay. Plus he is a really "forgotten" Disney and I'd like to bring him back into the lime light he deserves." "Don't give in to your Darkness."